OFM 247 Heavy Duty Dispatch Chair | Free Shipping! Our most popular big and tall chair. Heavy duty to withstand 24 hour shifts! This 24 hour dispatch chair from OFM can handle continuous sitting, 24 hours a day, 7 days a week. Plus, it can handle a weight capacity up to 400 lbs. The multiple ergonomic adjustments allow incredible custom configuration, for complete comfort 24 hours a day. Great for hospitals, police stations or other intensive use applications. This chair is available in your choice of commercial grade, stain-resistant fabric (Model 247) or anti-microbial/anti-bacterial vinyl upholstery (Model 247-VAM); both with a durable molded polypropylene outer back shell. As far as the caster options, the standard casters will work fine for most applications. The soft wheel casters just make a bit less noise on a harder floor and do not "skate" around as easily. The glides are plastic inserts or "stops" that fit into the base to keep the chair from rolling. This chair also meets or exceeds all ANSI/BIFMA standards. Dimensions: Seat Size: 20.25"W x 20"D. Back Size: 19.5"W x 21"H. Seat height adjustment: 19"-22.5"H. Limited lifetime warranty from OFM. 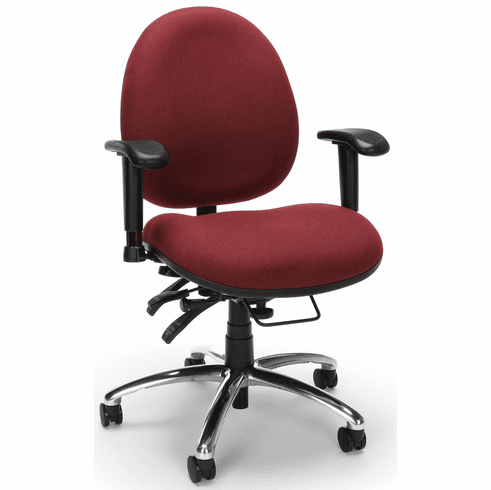 This OFM 247 heavy duty dispatch chair normally ships within 1 business day from our NC or AZ warehouse.